A fantastic act provided by Phoenix Promotions perform astounding tributes to two of most iconic recording stars of the century, Elvis Presley and Tina Turner. The show brings a wealth memories flooding back from Elvis’ early years right through to his Las Vegas years. Raving Rupert dons one of the famous outfits that Elvis was renowned for, which proves a charismatic portrayal of ‘The King’. 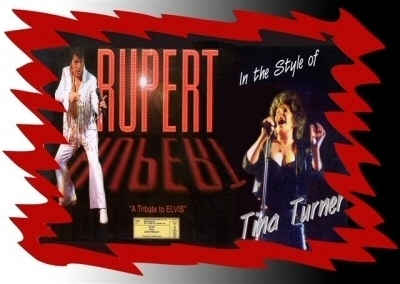 Fifty minutes of pure pleasure awaits Elvis fans as Rupert glides effortlessly through a repertoire of songs from the 50’s up until the death of Elvis in the mid seventies. This part of the show is swiftly followed by one of the most outstanding tributes to Tina Turner ever witnessed. Not only does our star bear more than a passing resemblance of Tina, but sings just like her and struts her stuff in Tina’s own inimitable style. You’ll hear all the favourite songs i.e Private Dancer, Nutbush City Limits, River Deep Mountain High and of course Simply The Best. Rounding off the evening’s show, Rupert makes his final appearance immaculately dressed in 50’s attire to rock the night away with songs by Bill Haley, Eddie Cochran, Chuck Berry, Gene Vincent and so many more. No one will be able to stay sat for long with so many hits from the past all designed for dancing. Tina Turner Tribute from Claudette Newman singing Steamy Windows. At RINCON DE LUNA BAR AND RESTAURANT Antigua Ctra. Guardamar - Rojales Km 3,5. Costa Blanca Spain. Rounding off the evening’s show, Rupert makes his final appearance immaculately dressed in 50’s attire to rock the night away with songs by Bill Haley, Eddie Cochran, Chuck Berry, Gene Vincent Billy Fury, and so many more. No one will be able to stay sat for long with so many hits from the past all designed for dancing.